විදුලි පංකා සමග සෙල්ලම් නොකළ යුත්තේ ඇයි? So if where to get you to do it for me, would you charge? if so how much? Rooting is the worry I have too =[ Don’t know how and never understood how either. If you can’t root just tell me. And it can be done with one click. Can it be rooted with one click? I got a Huawei Honor 6 and i am going crazy without sinhala in it. Tried to root it with root genius and vroot and failed. Is there a way to root this easily without taking much risk? I am not a developer. Is there a way to fix in android 4.0? Really good guide, found it really easy to follow and managed to install Sinhala on my tab. Thank you! Two things to clarify: Getting access to /system/fonts might not always be straightforward. You might have to remount /system to gain read + write privilege. Found this a useful guide on how to do it. (Read the whole thing through before starting). Also if you’re rooting in Linux you might have to run adb/fastboot in super user mode, so keep that in mind. Thanks man, it worked in My Xperia P running KitKat. I had installed MalithiWeb using “com.jrummy.font.installer”, but it didn’t work quite well. This, on the other hand, works superbly! Thanks for sharing the “Multilingual Keyboard”, as well. I was looking for a Wijesekara keyboard for a long time. Yes, we have to type kombuwa etc after the letter, but it’s forgivable. Then I pushed the file to system/fonts replacing the old file and fixed the permissions. worked well. Never knew about editing the XML file. Yes it should work fine. Earlier we did same for the previous android version other than this method. Can you please upload your samsung font file? මටත් උදව් කරන්න..මම මේ විදිහට කරා…ඒත් මොකකවත් සිංහල පේන්නේ නෑ හරියට.පොන් එක nexus 5. හරි ගියා..මම ෆොන්ට් එක මරු කලා potha කියන ෆොන්ට් එකට…බොහොම ස්තූතී. Awesome tutorial! Thanks for sharing – works great on My Xperia S running Pureslim KitKat. සිංහල ස්ථාපනය සාර්ථකයි. මාගේ ස්තුතිය. not work with Shiny Rom 4.4.3 or 4.4.4 on Galaxy nexus. Do you have any suggestion Bro? Not sure mate. I don’t have any experience with the ROM you’ve mentioned. Although it shouldn’t affect this, maybe the developers of it have done some customizations that affect it? I’ve tried this on Google Play Edition, Sense and another ROM called Android Revolution based on Sense 6 but didn’t face any issues. Maybe you could try the process again from scratch? To make sure that you didn’t miss anything. Thank you very much. It works in android 4.4.4 kitkat, gt-p5100. machan, I tried with HTC One M8 (4.4.2 kitkat). everything went well except the last step. once I reboot the device, newly added files are replaced by old ones. it seems like some kind of a reset happens. I used root explorer for pasting and overwriting.. any help? I’m not exactly sure why that’s happening machan. Are you on the official ROM? මටත් තියෙන්න ඔය ප්‍රශ්නයමයි. උඹ කොහමද හදා ගත්තෙ? got it done bro. I had to go through recovery mode (TWRP in my case). Just boot your M8 in recovery mode and change the mount in to r/w using your custom recovery software. 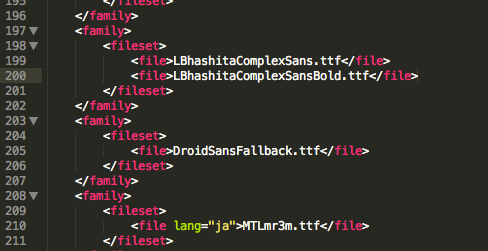 then copy and replace the edited xml file and required fonts (Bhashitha for Linux works for Android 4.4.2). finally reboot the system. cheers!! Akalanka, can you please explain the steps you did. I have a M8 and can’t get it working still. Thanks. මචන්, මාගාව තියෙන්නෙ HTC 816 Android 4.4 එකක්… දන්න සෙල්ලම් ඔක්කම දැම්ම ඒත් සිංහල එන්නෙම නැහ. ගොඩක් වෙලාවට පර්මිෂන් හින්ද තමයි කේස් වෙන්නෙ. තව පාරක් ට්‍රයි කරලා බලන්න. ls -l වලින් පර්මිෂන් හරියටම තියෙනවද කියල බලන්න පුළුවන් නම් හොඳයි. Thanks machan!! 100% working on xperia z kk. I did all the steps accordingly. 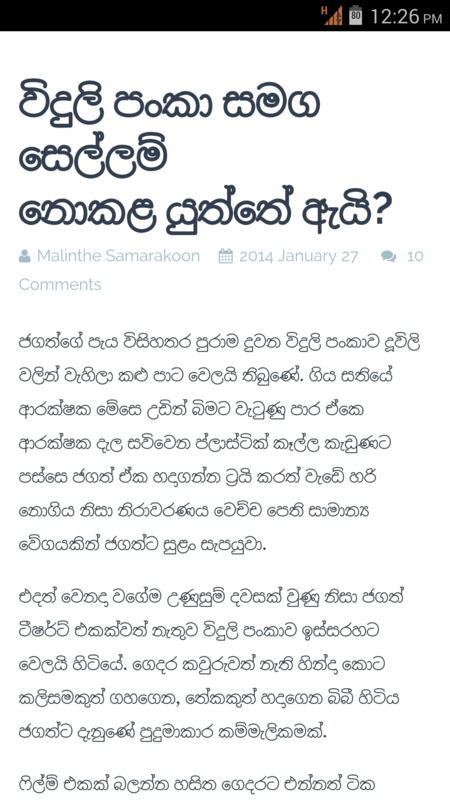 Now I can see Sinhalese in the web browser, but not in any other App. All I can see it some gibberish letters. I tried Bhashitha for Linux, LKLUG and Iskolapota, but the result it the same. I used the Sinhalese keyboard to post Tweets, but they are not visible for me, but other people see it as Sinhalese. hey bro…i have Nexus 5. i tried to get sinhala. already installed, Helakuru/ Sinhala plugin and try to all sinhala apps..i can write sinhala but still not display sinhala font on facebook, and all web browser. can you please tell me how to get sinhala my nexus 5.. I tried this with a modified version of DroidSansFallback.ttf and it worked perfectly. I didn’t even had to edit that xml file. I just copied it to the fonts folder and set rwx-r-r for that font and it worked perfectly for me. I have a Nexus 5 (4.4.4). Here is the font file. Cool 🙂 Was this modified by you? How’s the rendering? No, I didn’t. I found it on another blog, but it was for an older version of Android, but worked for me. Yes, it has some issues with rendering. I think it’s a matter of 4.4.4. I guess. If you don’t see Sinhala, make sure the font file has 744 or 766 permission. That means, others also have read permision, while only you have write access. Ah. I may have used this file before. Rendering issue was there even for older versions. Tried on Nexus 5 hammerhead Purity ROM Android 4.4.4 & worked like a charm. Working perfectly on xperia sp (android 4.3). I used LBhashitaComplexSans and LBhashitaComplexSansBold. Works like a charm! Thanks a lot for the article. I had to set 644 permissions for the font files I copied into the fonts folder. It is worked for me perfectly. Nice job. Thank you very much! Is there any hassle free way of doing this, I don’t wanna course trouble with warranty on my xperia z3compact…. Please join with “Wikasitha Syndi” the blog reader. You may automatically join by entering URL of your Blogger or WordPress blog. All other Feeds enable web sites could be joined. 3. No idea about i-os as I don’t have exposure. Thanks a lot Malinthe. Works perfect. However, Potha didn’t work for me in my Honor 6. Bhashitha for Linux works very well. 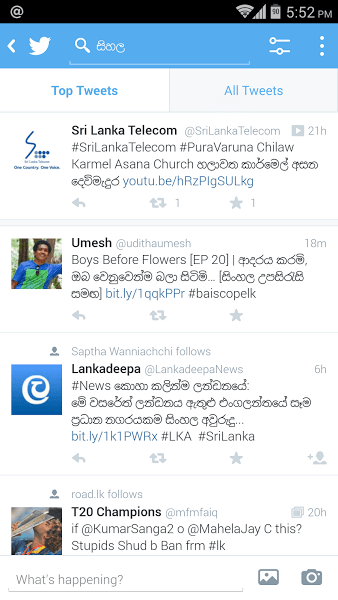 Sinhala now comes with all variants of Android 5.0.
woww.. thank you So much bro.. I was searching for sinhala fonts for my ZTE phone which run on 4.2.2.. potha font works perfectly..
Use Multilanguage android app from Google play store with Sinhalese plug in and my alpha font HONSO. Very easy. No need to root. even if you want other languages like Tamil can download plugins. you can swipe space bar and change langue easily. enable this keyboard in settings to change default keyboard. I have used most of Sinhala keyboards this is the best. Really helpful! Thanks a lot. Super and thank you so much. It worked with DialogK45 ! Thanks bro! you saved my time! I have followed the procedure you have outlined. Out once I reboot the device I can no longer see the font files in the fonts folder or the modified lines in the fallback_fonts.xml file?? I have followed all your steps corretly. My phone is HTC Desire 816 dual sim. Can you guess what could be the reason?? Thanks in advance. ගොඩක් ස්තූතියි. සහෝදරයා…. මම සිංහල දැම්මේ HTC Desire HD එකකට.